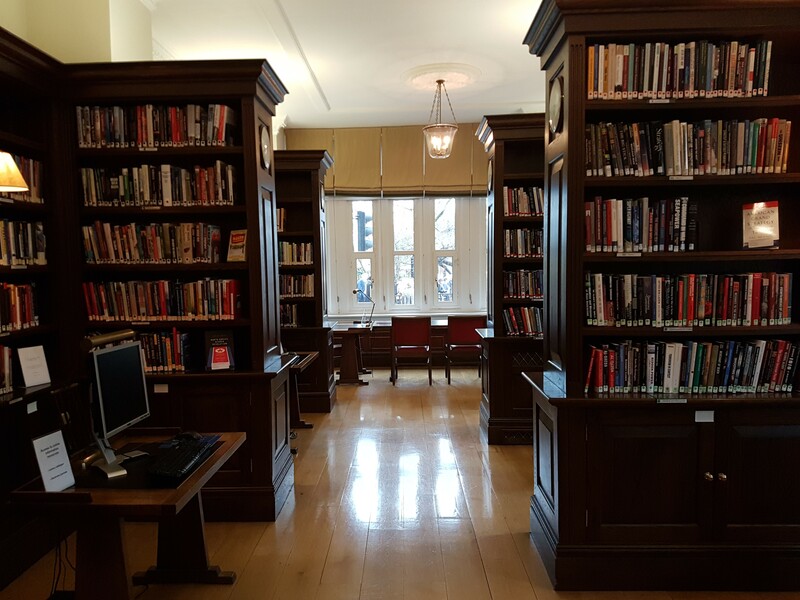 During the college’s Easter Break, I was fortunate enough to be able to arrange visits to some libraries that focus on the topics of military history and international affairs at four different institutions in London. Three of these institutions (RUSI, IISS, and Chatham House) are independent think tanks, whilst the other is a Private Members Club. As I had come to Oxford whilst completing my MSc in Security Studies, I was particularly eager to explore these libraries with which I felt an academic affinity. 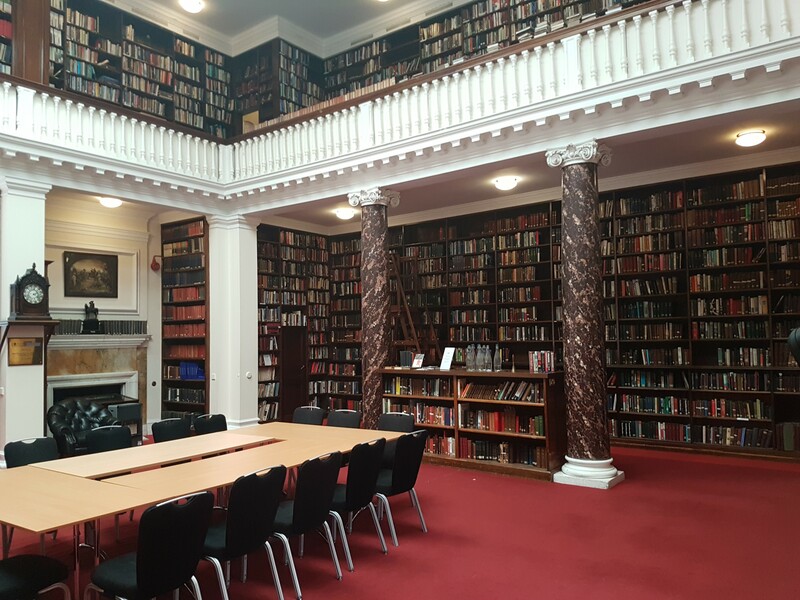 My first visit was to the Library of Military History at the Royal United Services Institute (RUSI), a defense and security think tank established in 1831 with the Duke of Wellington as the founding patron. This library focuses primarily on military history and has some fantastic rare books and modern manuscripts that are unique in the U.K. RUSI’s Librarian, Jacqui Grainger, guided me round the building and explained how the library works at RUSI. The architecture of the library is amazing, and it was a real treat to see some of RUSI’s most prized holdings. Jacqui’s role, however, does not end just with books and printed material but also covers the art and artifacts that decorate the walls and rooms of RUSI. This was particularly interesting, as it has parallels with some of the duties a College Librarian may be required to undertake. I found it incredibly useful talking to Jacqui about collection management, and the challenges that a library like RUSI’s faces. 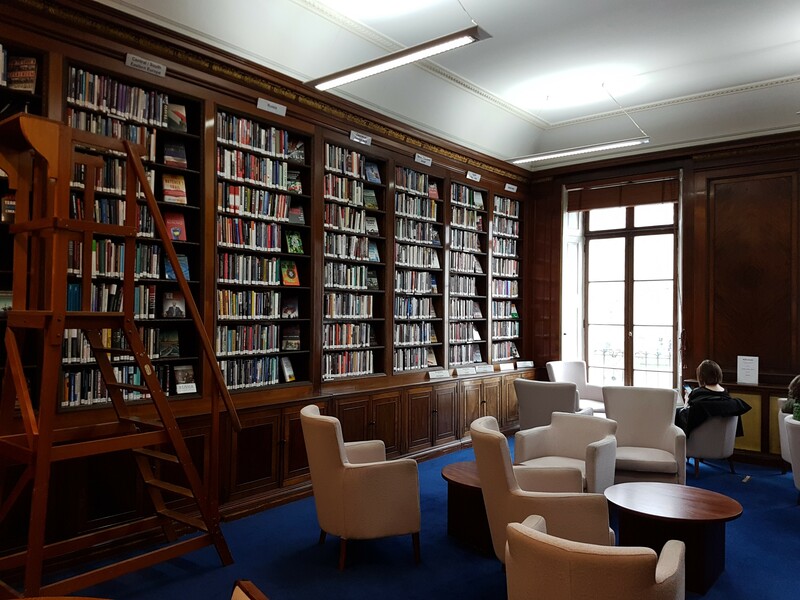 As the photo above shows, RUSI’s shelves are nearly full and if the library’s goal were to collect material covering future events then it would require much more space – possibly even including off-site storage. Therefore, difficult decisions need to be made: does the library attempt to comprehensively cover all future military developments, or does it focus on developing its historic collections and material relevant to its study. This brought to mind the collections decisions made with regards to Jesus College’s Celtic Library, and was a good demonstration of the challenges of collection management that are not always apparent to library users. Next, I visited the International Institute of Strategic Studies (IISS). Established in 1958 with a primary emphasis on nuclear deterrence and arms control, the IISS also operates offices in Washington, Bahrain and Singapore. 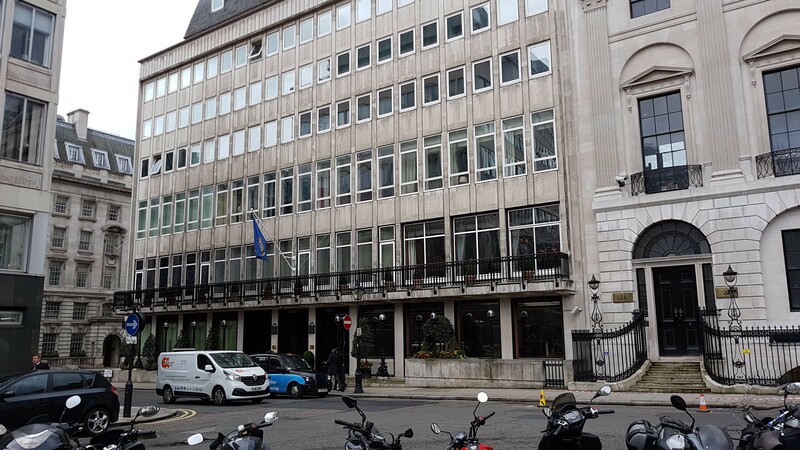 I was met by Kevin Jewell, IISS’s Head of Knowledge and Information Services, who explained how the IISS library has moved away from its previous role as traditional lending service and more towards information management. The library still has a core collection of books, though the emphasis is now on how it can actively support the researchers and their work. Given that the IISS employs researchers around the globe, it is perhaps unsurprising that the management of electronic resources has become increasingly more relevant. Kevin showed me some of the strategies and tools they use to collate publicly available information and the methods they use to present this information to the staff in a relevant and easily accessible way. He also highlighted how the library signposts electronic resources (and more importantly how to access them), and Graham Ivory, the IISS’s Information Specialist, demonstrated how incredibly useful a well-designed intranet can be to supporting a group’s aims. He explained that not only is content important, but also how a clear and easy to navigate layout is vital to encourage users to make the most of the resources provided. This was very useful as it made me consider design from a user’s point of view: what features would make me more or less likely to interact with the environment? However, printed material still plays an important role. Hilary Morris, the IISS’ Librarian, showed me how they are making a determined effort to collect material relevant to the IISS’ history in their archive, and the challenges that preserving these sources presents. Seeing these documents that stretch back to the IISS’ foundation was fascinating (especially considering how the IISS is approaching its 60th anniversary) and they will no doubt be hugely significant for future researchers. Having seen the importance of these archival documents, I was made aware just how vital strategies for collecting current electronic documents are, so it was interesting to hear how the IISS intends to tackle this issue. My next destination was Chatham House, more formally known as the Royal Institute of International Affairs. Formed in 1920, this think tank focuses its attention on the world’s major international issues. Chatham House was, in a sense, the most ‘traditional’ of the libraries I visited. With a dual focus of supporting their research staff as well as its members (who range from students to retired professionals), the Chatham House library is very active in its collection of relevant books and journals. Talking to Binni Brynolf, the Digital Resources Librarian, gave me a really good impression of the library’s function and how it has adapted to meet its users’ needs. Due to size of their collection, only the most recent publications (i.e. within the last 15 years) are kept on site; the rest is stored off-site and must be called-up. This immediately made me think of the Bodleian’s Book Storage Facility in Swindon, and it was fascinating to hear how they deal with book requests. Having just helped plan the move of Jesus College’s lesser-used Celtic journals to an on-site storage space, I could well appreciate all the forethought required when preparing for off-site storage! I really enjoyed learning about the library’s management system, and comparing it to what I am used to at Oxford. Due to the different scales of the libraries, both have different needs so it was interesting listening to Binni describe what system suits a specialist library like Chatham House. I was even more intrigued to learn about ebooks, and what role they may play in the future. Ebooks are not currently a big feature of Chatham House’s library, but a lot of thought is being given as to whether the advantages of these electronic resources would justify the (not insignificant) cost. Not all ebooks are created equal, and some texts are better suited than others are; consequently, it is really interesting to see how things will develop! My final visit was to the library at the Army & Navy Club, a.k.a. ‘The Rag’. Unlike the other three libraries I visited, the Army & Navy Club is a Private Members Club with strong historic links with the British and Commonwealth Armed Services. As the library is for the members to borrow at their leisure, it does not need to be as comprehensive as a research library, nor does it require that the members have access to online resources. Yet even a cursory glance as the shelves reveals a wealth of interesting titles on military history that would well match the members’ interests. I found talking to Jane Branfield, the Club’s Librarian who is a professional archivist by training, about her role and career progression incredibly useful. Her experiences made me realize that certain roles require the ability to balance many different skills. Furthermore, Jane explained how prior experiences in one role, such as creating a database on generals in a military archive, could easily translate into different areas, such as working on a project detailing historic barristers for the Inner Temple. The main lesson I took away was to take up different opportunities as they arise, even if they seem removed from what might be considered the core duties of a librarian; you never know when you may need to call upon different skills and experiences in future jobs. Though similar in thematic content, each of the libraries felt different and unique, and each displayed real-world practices and challenges that we have been learning about on the Trainee Programme. A particular theme that ran through my visits was the importance of preserving archival material. Some places had inherited an abundance of material, whereas in others the gathering of material (much of which may have already been lost) was very much a current concern. However, all were deeply aware of the issues of what will happen now so much of our working lives are enacted digitally. What was once an easily filed letter is now an intangible email, and so without any intervention much useful material may be forever lost to future researchers. This is a particular point that we have learnt about at the Bodleian, so it was fascinating to see that these issues in settings external to Oxford. I would like to say a huge thank you to Jacqui from RUSI, Kevin, Graham and Hilary from the IISS, Binni from Chatham House, and Jane from the Army and Navy Club for all the time they spent explaining their work to me and for giving me such a great insight into their libraries. The information and advice everyone gave me was invaluable, and will be a huge help to me as I plan my future career in librarianship. The OxCam College Librarians’ Biennial Conference, Pt. I. The OxCam College Librarians’ Biennial Conference Pt. II.